How do I remove restrictions from my Facebook page? 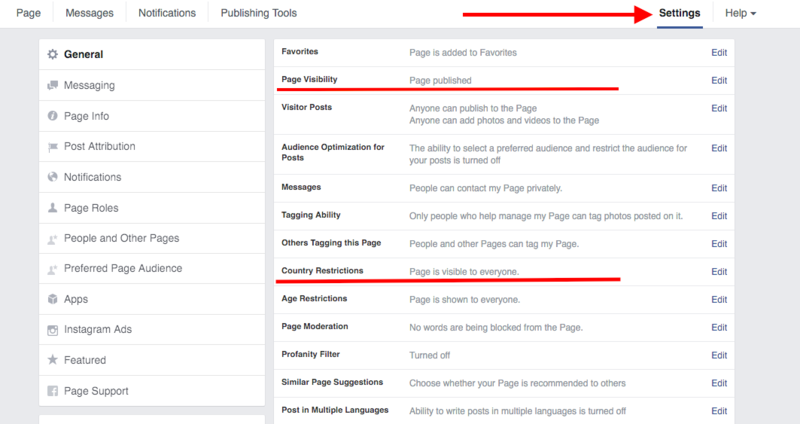 You cannot connect a Facebook page to RetargetApp if it is unpublished or if the country restrictions are set. Open the business page you would like to connect. Click on the Settings in the top right corner. On the General tab find Page Visibility line. It should be set to “Page published”. If it isn’t, please, click Edit and publish the page. Click “Save Changes”. On the same tab find Country Restrictions line. It should be set to “Page is visible to everyone”. If it isn’t, please, click “Edit” and remove all country restrictions. Don’t forget to hit “Save Changes”. Once you are done changing the settings, please, go to RetargetApp or refresh the page with the app if you still have it opened. Now you can proceed to create and run your first campaign. Yay! If nothing seems to work, please, contact Support by clicking on the green circle in the bottom right corner of the page — don’t forget to include the link to the page you would like to connect.